How would you like to win a pink Husqvarna 450 Rancher chainsaw? October is Breast Cancer Awareness Month, which is an annual campaign to increase awareness of the disease. Husqvarna is doing their part to raise awareness by donating $3 to the GreaterGood for each pink chainsaw sold. The contest to win a chainsaw is free to enter. No purchase necessary. Starts at 12:01 am on Oct 1 — not a second sooner. If you want details, we have them. We tell you exactly what you need to do to enter this Husqvarna giveaway. Win a Husqvarna Pink Chainsaw! Fill out the online entry form on the Husqvarna USA contest page. No purchase is necessary to enter or win. No other method of entry will be accepted. Fill out the online entry form on the Husqvarna CANADA contest page. Contest Draw: Monday, November 2nd, 2015 at 12:00 pm EST. Do your part in helping raise awareness for breast cancer month. Spread the word. Share it with friends and family. Tweet it out. Post it on Facebook. Make a difference by spreading the word to others, and, if you’re lucky you might be the owner of a cool pink 450 Rancher or a pink toy chainsaw. You can’t buy a pink Husqvarna 450 Rancher in the store so this is your chance to own something unique. It truly is a special saw. Will you be the lucky one? For a limited time you can buy the pink toy chainsaw from Husqvarna — and $3 will be donated on your behalf. It’s a win-win for everyone. View or download the Official Contest Rules. NO PURCHASE NECESSARY. Internet access and valid email account required. Online entry through the Website (as defined below) only; no other means of submission will be accepted. There is one (1) method of entry for this Contest: To enter during the Contest Entry Period, go to Husqvarna Contest Page (“Website”) and sign up for the contest by providing all of the required information (“Entry”). By submitting your Entry, you are indicating that you have read, understood and accepted these Official Rules. Entries must be received within the Contest Entry Period to be eligible for the Contest. Entry must be submitted by the entrant him or herself. Entrant may only use one (1) email address. LIMIT: one (1) Entry per person during the Contest Entry Period. Multiple Entries received from any one (1) entrant beyond this limit will void all such additional Entries. Any Entrant found to be using multiple accounts to enter will be disqualified. Entries generated by a script, macro, or other automated means will be disqualified. Husqvarna Professional Products Inc. Breast Cancer Awareness Month Giveaway(“Contest”) is open only to legal residents of the United States who have reached the age of majority at time of entry. Follow Husqvarna USA on Twitter. Share your thoughts & Like Husqvarna on Facebook. Log on to Facebook (*If you don’t have an account then register one). Go to the Facebook Husqvarna USA page and “Like” the page. ✓Learn more on the GreaterGood official Facebook page. October is Breast Cancer Awareness Month. Husqvarna is committed to raising awareness of this disease and will donate $3 to the GreaterGood.org for every pink Husqvarna toy chainsaw sold. One winner will be randomly drawn to win a pink Husqvarna 450 Rancher chainsaw or a pink toy chainsaw to support breast cancer awareness! You can help raise more money for GreaterGood.org by liking the Husqvarna page on Facebook (USA) and sharing this giveaway on social sites like Twitter. Subject to the conditions herein, one (1) Contest Winner will receive a prize package, consisting of the following prizes: One (1) Pink Husqvarna 450 Rancher Chainsaw and one (1) Toy Pink Husqvarna Chainsaw (“Grand Prize”). One pink Husqvarna 450 Rancher. The approximate retail value (ARV) for the Grand Prize is $429.90. The Grand Prize may not be redeemed or exchanged for cash. One Pink Husqvarna toy chainsaw modeled after the 440 model. *Additional Consideration. For each completed Entry, Husqvarna will donate $1, up to $10,000, to GreaterGood.org, located at 6262 N. Swan Ave Suite 150, Tucson, AZ 85718. How would you like to own these? Ideal for: Firewood cutting, large to medium size tree cutting, storm clean-up and good for small size tree cutting and trimming and pruning. X-Torq Engine is fuel efficient and creates fewer emissions. Easy to start with Husqvarna’s proprietary SmartStart. Excellent anti-vibration technology reduces fatigue and increases safety and comfort. Side-mounted chain tensioner gives you easy access. Large felling/bucking spikes give you improved leverage while cutting. Snap-lock cylinder cover: easy access to the air filter and spark plug for routine maintenance. As you can see, this is a fantastic chainsaw but more importantly, this is a cause worth participating in. Even if you’ve never been affected by breast cancer I encourage you to do what you can to help the experts find a cure or improve their treatment methods of breast cancer. The Husqvarna 450 Rancher is an excellent all-around chainsaw for homeowners. 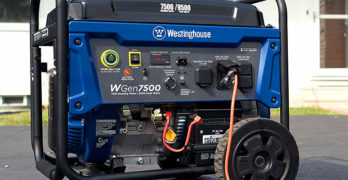 Plenty of power at 50.2cc, designed for medium-duty cutting around the home. This is a chainsaw that we highly recommend. It has proven itself to be an easy-to-use and reliable workhorse. A modern classic. If you win the contest, just think of the looks you’ll get when you’re out in your yard felling trees. Breast cancer is an important issue that scientists and doctors all over the world are trying to solve. Do what you can to help. You can donate your own money as well. If you can afford it, give a few dollars to cancer research. Here are the best organizations to donate to — where your money will actually go towards research, prevention, education and patient support. Looking for the best charities to donate to, browse Charity Navigator to find reputable organizations. GreaterGood.org is an independent 501(c)(3) charitable organization devoted to improving the health and well-being of people, pets, and the planet. GreaterGood has given over $30 million to charity partners and programs worldwide that work toward our mission. Alleviating and addressing the root causes of world hunger and food insecurity, and promoting peaceful co-existence. Early detection and treatment of breast cancer and other widespread health concerns, particularly in women. Preventing and treating childhood illness, disease and other children’s health and well-being concerns. Promoting children’s literacy and education. Protecting and restoring the environment. Providing care and feeding of rescued animals in shelters and sanctuaries and addressing the root causes of their conditions.